Christine Stevens is an internationally acclaimed speaker, author, and music therapist. Holding masters degrees in both social work and music therapy, Christine inspires people all over the world with her message of music for holistic health, spirituality and wellness. Christine is the author of The Healing Drum Kit, The Art and Heart of Drum Circles book and DVD and two CDs; Reviving Rhythms, and Drumming Up Diva. As a member of an integrative research team, Christine has published studies on the scientific benefits of group drumming. Christine serves on the editorial board of Explore: The Journal of Science & Healing. 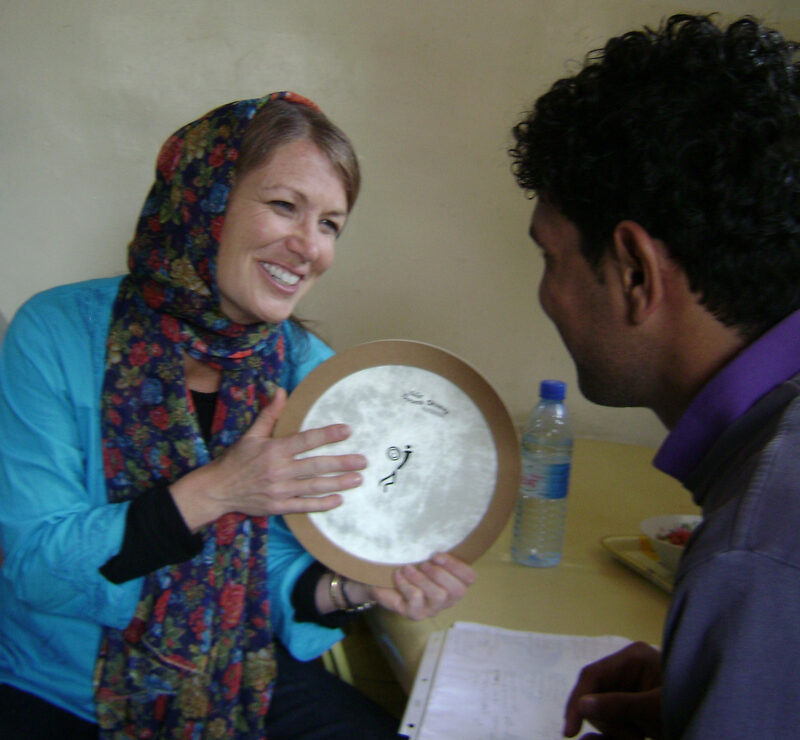 With over 20 years of experience developing drumming programs for such groups as Columbine High School, Ground Zero, survivors of hurricane Katrina, and most recently, created the first drum circle training program in northern Iraq. She has also worked with many Fortune 500 companies, including DuPont, The Department of Defense, Disney and Verizon. Christine is the founder of UpBeat Drum Circles, offering diversity training, teambuilding, and wellness presentations world-wide. She has trained facilitators and led workshops in more than twenty countries, including Hong Kong, Brazil, South Africa, Japan, and Western Europe. Christine trains HealthRHYTHMS facilitators throughout the United States, England and Japan through Remo, the world’s largest drum company. A leader in the music and wellness movement, Christine also serves on the editorial board of Explore: A Journal of Science and Healing. Christine’s work in Iraq was recently featured in the book and DVD Discover the Gift. Televised media credits include: PBS Healing Quest TV, NBC, KABC–Los Angeles, KTLA – Los Angeles, Tournament of Roses Parade, London Tonight, Living Better TV, Discovery Health, & Hong Kong News. As a contributing writer, Christine’s work has been featured in Fitness Magazine, Spirituality & Health, Body & Soul, Fast Company, First for Women Magazine, The Oriental News, The Christian Science Monitor, US News & World Report, Yogi Times, and Natural Beauty and Health.